A significant debilitating factor for those afflicted with autism spectral disorders (ASD) is impairment of social communication. Now, a team of investigators from the Universities of Geneva (UNIGE) and Basel (UNIBAS), in Switzerland believe they have uncovered what happens in ASD patients’ brains that disrupts their social skills. 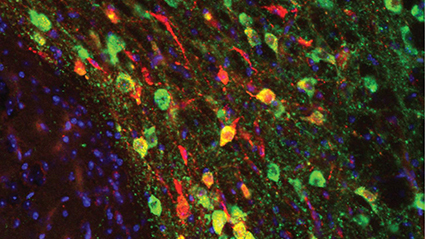 Findings from the new study—published today in Nature Communications through an article titled “Role of VTA dopamine neurons and neuroligin 3 in sociability traits related to nonfamiliar conspecific interaction”— establishes a link between a genetic mutation found in people who have ASD. For mammals, the reward system is a fundamental brain circuit that reinforces certain behaviors by providing the motivation necessary for their achievement. Searching for food, learning, or emotional behaviors are for instance, strongly linked to this neural pathway. Recently, several studies have shown that dysfunction of this system could be at the root of the alteration in social behaviors typical of autistic disorders. Dopaminergic neurons, essential to its proper functioning, would be deficient in people with these disorders, who would thus lose all motivation to interact with others. But what are the underlying neurobiological mechanisms? “Basing ourselves on the hypothesis of motivation, we wanted to decipher the role of dopaminergic neurons in social interactions to verify whether alterations could explain certain social deficits specific to people suffering from autism spectrum disorders,” explains senior study investigator Camilla Bellone, Ph.D., professor in the department of basic neurosciences at UNIGE Faculty of Medicine. Scientists have also studied the synaptic plasticity of mice (synapses being the part of neurons that allows them to communicate with each other). Normally, exposure to social novelty generates a synaptic modification that maintains interest and social contact. For instance, in mice with neuroligin three deficiency, this plasticity was much less present: synaptic reinforcement did not take place, which resulted in a poorer response to a new stimulus. “We have observed the same synaptic deficiency in animals carrying another genetic mutation—on the Shank 3 gene—also common in autism,” Dr. Bellone notes. “It is, therefore, a matter of poor maturation of the synapse which, in the end, prevents good social development.” “We showed that chemogenetic inhibition of dopamine (DA) neurons of the ventral tegmental area (VTA) attenuates exploration toward nonfamiliar conspecifics and interferes with the reinforcing properties of nonfamiliar conspecific interaction in mice,” the authors added. “Exploration of nonfamiliar stimuli is associated with the insertion of GluA2-lacking AMPA receptors at excitatory synapses on VTA DA neurons. These synaptic adaptations persist upon repeated exposure to social stimuli and sustain conspecific interaction.” Autism presents such a variety of symptoms that it is impossible to provide all patients with the same treatment. “In order to better target treatments, it is imperative to classify behavioral disorders precisely on the basis of dysfunctions in certain brain circuits and to understand their genetic origin,” emphasizes study co-author Peter Scheiffele, Ph.D., a professor at the Biozentrum of UNIBAS. Thus, patients with synaptic alterations in dopaminergic neurons should react positively to therapies aimed precisely at increasing their activity, while these same therapies would remain ineffective in other patients whose social disorders would be due to another cerebral dysfunction. Moreover, since synaptic maturation occurs early in life, the earlier the exact causes of the disorder are identified, the more effective therapeutic interventions will be.